A thoracic aortic aneurysm repair is a surgery to fix a problem in the aorta. The aorta is the largest blood vessel in the body. It starts at the heart and passes down through the chest and abdomen. The thoracic aorta is the part of the aorta in the chest. The aorta carries blood from the heart to blood vessels that supply the lower body. This is a major surgery. An aneurysm is a weakened area of the blood vessel wall. If the aneurysm is large or continues to grow it can break open. In large blood vessels, this can lead to severe bleeding. A break in this blood vessel is often fatal. Surgery may be done if there is a thoracic aortic aneurysm that is large or increasing in size. Smoking and heavy alcohol use may increase the risk of problems. Talk to your doctor about these risks before the procedure. Stop eating or drinking anything after midnight the night before your surgery. Stop taking some medications up to 1 week before the procedure. Let your doctor know about any medications or supplements you may be taking. General anesthesia will be used. It will block pain and keep you asleep during the surgery. This may be done as an open surgery or using an endovascular approach through one of your arteries. For the endovascular repair, a small incision will be made in your leg. A small tube will be inserted in this incision and into the aorta. It will be moved up to the aneurysm. The tube will take pressure off the wall and prevent it from expanding or leaking. If you need additional heart surgery, it may be done at this time. The incision will then be closed. In some cases, open surgery may be needed. An incision will be made in the chest. The ribs will be spread. 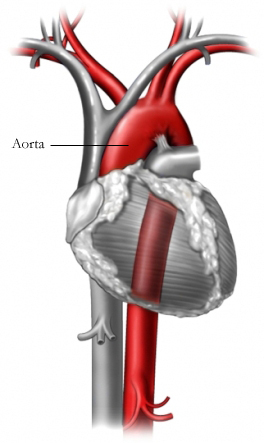 The weakened area of the aorta will be replaced with a graft. The graft will be sewn into place. Blood will be able to flow through the graft. If you need additional heart surgery, it may be done at this time. The chest incision will then be closed with stitches or staples. After the operation, you will be taken to the recovery room. Your heart, blood pressure and other vital signs will be monitored. Anesthesia prevents pain during surgery. You will be given pain medication to help manage pain during recovery. The usual length of stay is 7 days. If you have the endovascular procedure, the hospital stay is usually shorter. If you have any problems, you may need to stay longer. Provide you with medication and nutrition through an IV. Ask you to take deep breaths and cough to prevent mucus from collecting in your lungs. Ask you to walk down the hall when you are able. Ask you to drink liquids until you can tolerate more solid foods. Follow a diet that is low in fat and includes fruits, vegetables, and whole grain foods. Participate in a rehabilitation program if advised to do so by your doctor. If you have an emergency, call for emergency medical services right away. Healthy heart diet. Cleveland Clinic website. Available at: http://my.clevelandclinic.org/heart/prevention/askdietician/healthydiet.aspx. Accessed March 6, 2018. Thoracic aortic aneurysm. EBSCO DynaMed Plus website. Available at: http://www.dynamed.com/topics/dmp~AN~T908572/Thoracic-aortic-aneurysm. Updated June 1, 2017. Accessed March 6, 2018. Thoracic aortic aneurysm surgery. Cleveland Clinic website. Available at: http://my.clevelandclinic.org/services/heart/services/aorta-surgery/surgerythoracicaneurysm. Accessed March 6, 2018. Thoracic aortic aneurysm repair (open surgical). University of Wisconsin-Madison School of Medicine and Public Health website. Available at: http://www.uwhealth.org/heart-cardiovascular/thoracic-aortic-aneurysm-repair-open-surgical/11103. Accessed March 6, 2018. Aneurysm. National Heart Lung and Blood Institute website. Available at: http://www.nhlbi.nih.gov/health/health-topics/topics/arm. Accessed March 6, 2018.